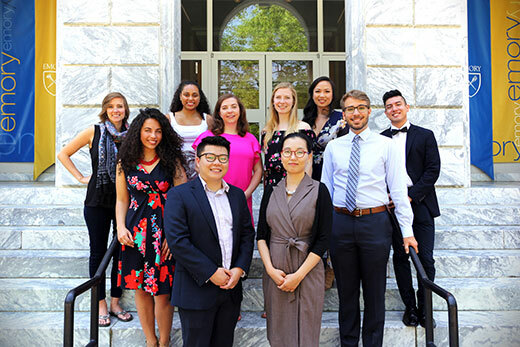 Emory’s Fulbright awardees for 2018 include (back row, left to right) Emily Pingel, Asha Fradkin, Julia Munslow, Jonathan Conde-Peraza, (middle row) Abigail Lopez-Rivera, Nora Sullivan, Lydia Rautman, Zachary Denton, (front row) Chebon Ryan and Hyemin Na. Not pictured are Lamija Grbic’, Chris Merwin, Rifat Mursalin and Andrew Shifren. Emory undergraduates, including those in nursing and business, and recent undergraduate alumni who are interested in applying for future Fulbright awards can read up on the process here. The internal application deadline is Sept. 6. Information about applying for Fulbright through Laney Graduate School is listed here. Completed internal applications are due Aug. 27 by 11:30 p.m.
Fourteen Emory University young alumni and graduate students will travel to nine countries in the coming year as part of the 2018 Fulbright U.S. Student Program. As recipients of the flagship international exchange program sponsored by the U.S. government, the winners will carry out research or coursework of their own design or be placed as native speakers in schools overseas to supplement language instruction as part of the English Teaching Assistant Programs. The 11 bachelor’s and master’s level recipients were selected from 45 Emory applicants, of which 21 were named semi-finalists. One additional finalist declined the award. Three PhD students from Laney Graduate School received research awards. “This year’s cohort of Fulbright applicants at the bachelor’s and master’s level was the largest we’ve ever had, and also included the highest number of finalists selected for the award,” says Megan Friddle, director of Emory’s National Scholarships and Fellowships Program. “The students and alumni selected for the Fulbright program provide a wonderful illustration of Emory’s broad academic strengths, as well as the campus culture of servant leadership,” she adds. Six students pursuing PhDs through the Laney Graduate School applied, with four named as semi-finalists. Three were selected to conduct research projects for their dissertations. Chris Merwin, who is pursuing a PhD in philosophy, will travel to Germany to examine the experience of time based on an analysis of the later, unpublished manuscripts of Martin Heidegger. Hyemin Na, a doctoral candidate in religion, is headed to South Korea to investigate how digital media producers in an influential megachurch embed societal norms regarding race, gender and class in the church apps and website. Emily Pingel, a doctoral candidate in sociology, will research the role of community health workers in delivering care in a specific neighborhood of São Paulo to understand the patient-provider interactions in Brazil to inform efforts to strengthen primary care globally. Lamija Grbic’ 17C, philosophy and sociology; 2018 Robert T. Jones Jr. Fellow, University of St. Andrews, MLitt moral, political and legal philosophy, will travel to Bosnia Herzegovina to examine how NGOs navigate ethnic discourses and the remembrance of the past in post-war Mostar, Bosnia and Herzegovina, as a way to better understand how institutions construct, reinforce or challenge ethnic identities. Abigail Lopez Rivera 16C, international studies, 18MPH health policy and management, is headed to Sierra Leone to explore where donations for capacity-building programs following the Ebola outbreak were successful to develop a guide for future donor interventions.